Looking for something a little more stylish than the usual plain Jane tote bag? Check out these red, white and blue 1965 "American Legend" 100% cotton bags designed by Nicholas Hunziker, now just $10.00! 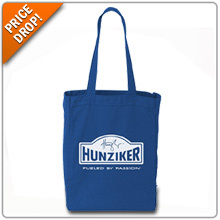 This is the perfect bag to take with you to your local car shows or automotive events. Don’t miss out because this special ends July 6th.